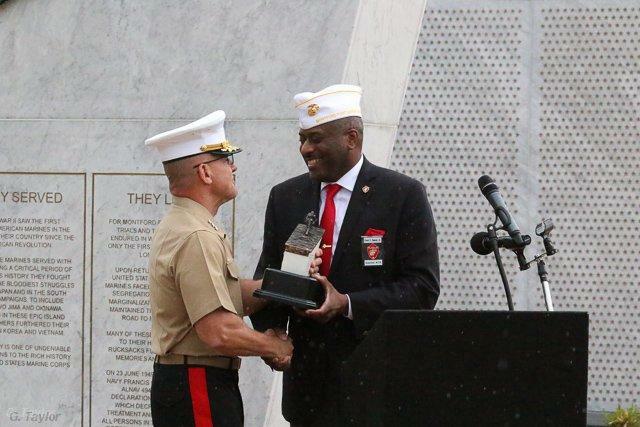 President of the Montford Point Marine Association Forest Spencer transfers responsibility of the Montford Point Memorial to Commanding General of the II Marine Expeditionary Force Lt. General Robert Hedelund on July 25, 2018. Last month, the National Montford Point Marine Association held their annual convention in Jacksonville with special events to honor the first African Americans in the Marine Corp.
Johnny Young Jr. is the President of the Montford Point Marine Association Chapter 10 in Jacksonville. He helped organize events during the national convention to honor the Montford Point Marines. The four-day meet up started with a gifting ceremony at Lejeune Memorial Gardens where responsibility of maintaining the Montford Point Memorial was transferred to the Department of the Navy. Commanding General of the II Marine Expeditionary Force Lt. General Robert Hedelund. The story of the Montford Point Marines starts in 1942. The United States was involved in World War II and there was a sudden need for jobs in the defense industry. President Roosevelt issued an executive order that gave African Americans the opportunity to enlist into the Marine Corp, the last branch of the Armed Services to accept African Americans. One of the first men to sign up when he was just 17 was Edwin Fizer. He’s now 93 years old. 93-year-old Edwin Fizer, an original Montford Point Marine, speaking during the monument dedication ceremony. The first black Marines were sent to boot camp at Camp Montford Point in Jacksonville. Many of the recruits didn’t know they were being sent to a segregated training camp. Recruits at Montford Point were not allowed to go to nearby Camp Lejeune unless a white officer accompanied them. 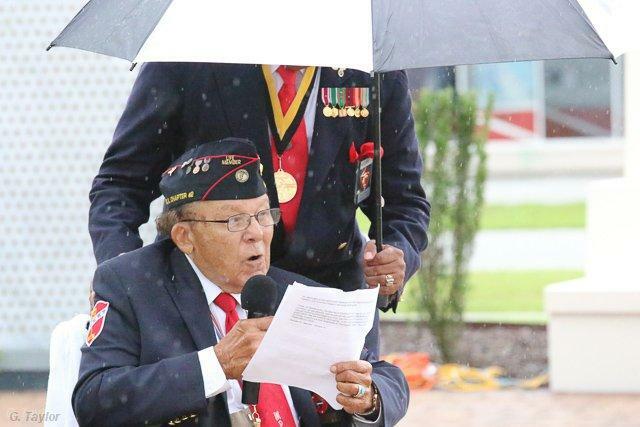 92-year-old Robert Hammond, one of the first African American Corpsman sent to Camp Montford Point, says Jacksonville wasn’t safe for black marines either. During the early years at Camp Montford Point, white drill instructors were in charge of training young recruits. That changed over time as African American leaders like Sergeant Major Edgar Huff and Sergeant Major “Hashmark” Johnson were put in positions of authority. 93 year-old Vaughn Whitworth, a North Carolina native, was drafted into the Marine Corp in 1943. He says his drill instructor was taught by Sergeant Major Huff and Sergeant Major Johnson. Montford Pointers were trained in support roles like cooking and supplying ammunition. They were also taught hand-to-hand combat and how to defend themselves with knives because at first Montford Pointers weren’t allowed to have guns. Whitworth, who was assigned to an ammunition depot, says their non-combat role changed after they proved themselves in the Battle of Saipan in 1944. Montford Point Marines were involved in other battles in the Pacific, including the capture of Iwo Jima from the Japanese in 1945. It wasn’t until three years later that President Truman signed an executive order abandoning segregation in the military. In total, about 20,000 African Americans were trained at Camp Montford Point during the 1940s. 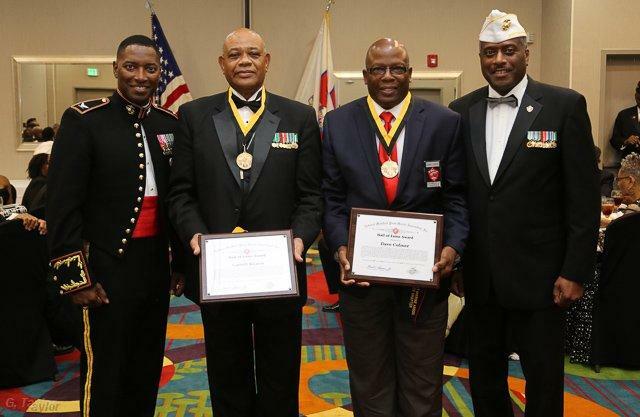 Two Montford Point Marines received the Congressional Gold Medal during the four-day convention. The Association posthumously awarded ten gold medals to family members of Montford Pointers. To recognize their contributions, a ceremony was held last month to honor two Montford Point Marines with the Congressional Gold Medal. The Association posthumously awarded ten gold medals to family members of Montford Pointers. President of the local Montford Point Chapter Johnny Young Jr. says he hopes to educate young marines on the role Montford Pointers played in paving the way for future black Marines. One of the young marines who attended the national convention is Gunnery Sergeant Louis Bon-Ami. Bon-Ami says he’s inspired by conversations he’s had with some of the Montford Pointers, saying he has a new understanding of the challenges they faced, and a greater appreciation for their ability to persevere. PRE honors the legacy of the Montford Point Marines in a new series called “Montford Point Memories.” We’ll hear from the brave men who were among the first African-Americans to serve in the Marine Corp on Mondays at 7:45 during Morning Edition and at 4:45 during All Things Considered. 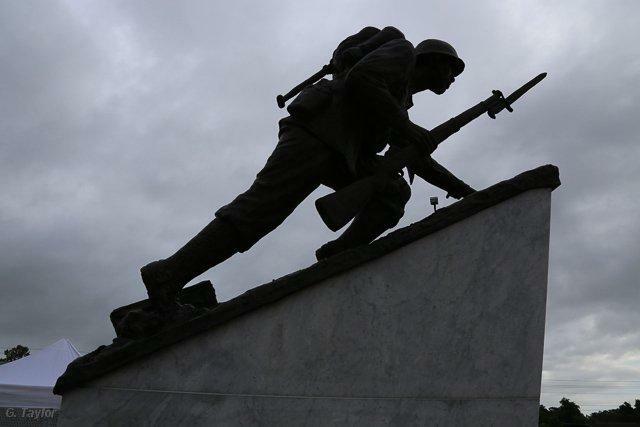 The memorial’s centerpiece, a sculpture of a Montford Point Marine ascending a hill, represents the struggle of African American Marines who experienced segregation and discrimination in service.